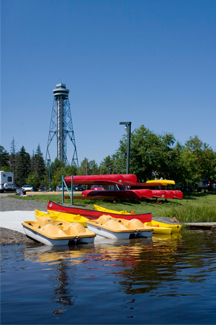 A natural island on the Saint-Maurice River, right in downtown Shawinigan, with accommodations and sporting activities! Accessible by car, bicycle and on foot, the Melville Island Park included two islands: Melville and Bananas ans a very large wooded area with hiking and bike trails. You want to rest: choose the Melville Islans Inn, 4-star camping, ready-to-camp, bubbles tents, yurts or chalets. Have fun at Tree Link in our hundreds of aerial games: nets, barrels, bridgets, zip lines and already at the age of 2 years old. Then sail by canoe or kayak through the many islands of the majestics Saint-Maurice River. Indulge yourself at an affordable price ! use rivière Saint-Maurice. Gâtez-vous à prix abordable !